Image acquisition is made by David Lane. He sent a massive amount of data to me to process and here is the first result, the Great Galaxy of Andromeda with 37 hours of exposure time. 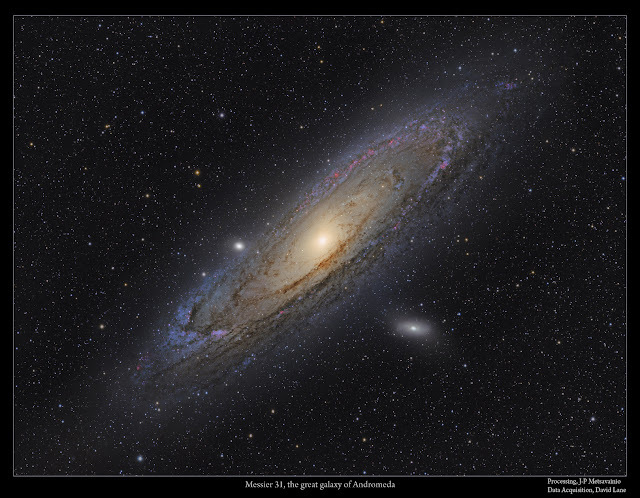 This photo shows the M31 as it was seen just outside of our home galaxy, the Milky way. All the stars in the first photo are located in Our galaxy at maximum distance of few tens of thousands light years. 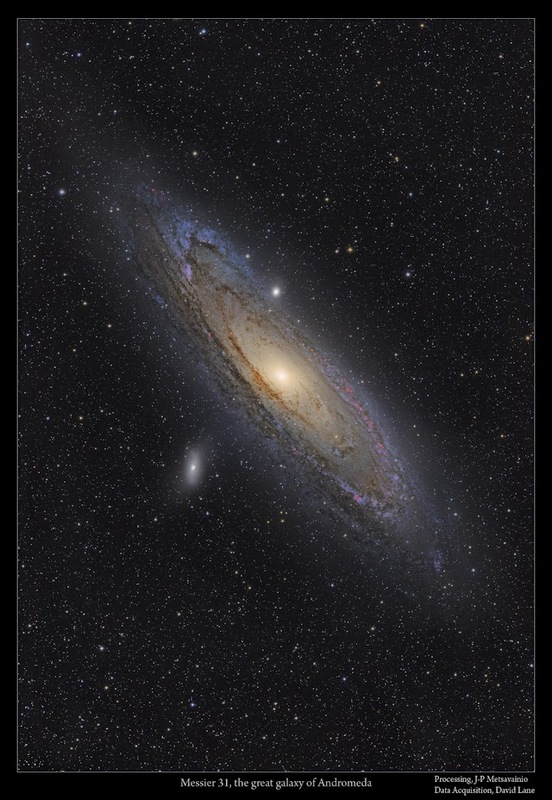 M31 lies at distance of about 2.5 million light years. There is 2.5 million light years of nothing between us and Messier 31. Dim dots at the starless image are more distant galaxies and some hundred of globular cluster associated to M31 galaxy . 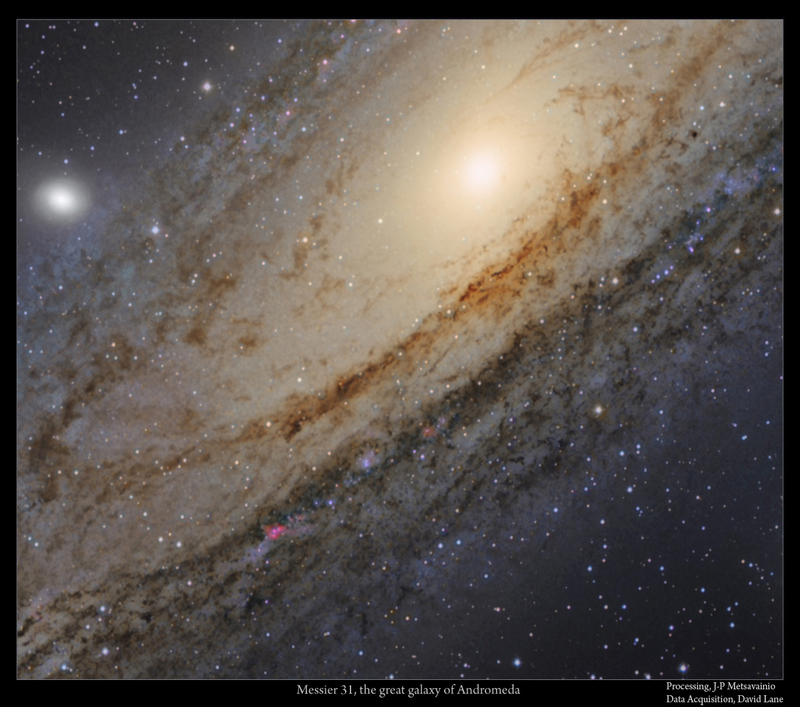 The Andromeda Galaxy, also known as Messier 31, M31, or NGC 224, is a spiral galaxy approximately 2.5 million light years from Earth. 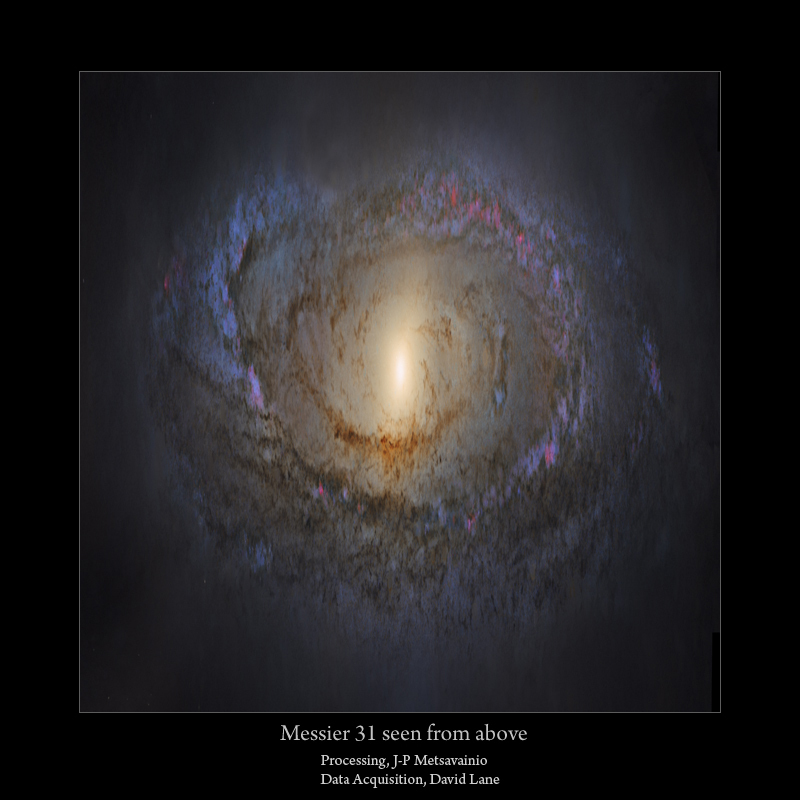 It is the nearest major galaxy to the Milky Way. The Milky Way and Andromeda are expected to collide in 3.75 billion years, eventually merging to form a giant elliptical galaxy or perhaps a large disk galaxy. This funny looking image is just stretched vertically to try to show the actual round shape of the galaxy. It looks like a barred spiral to me. My college graphic design professor would say that strong diagonal compositions are cheap attention getters. Being an amateur astronomer myself all I can say J-P is JUST STUNNING! Especially for an 81mm scope. It does give you that very wide FOV though. Many, if not most, of my photos are taken with a second hand camera optics. As you know, many nebula formations has a large angular dimensions. Have a look and you'll see what I mean. Images are partly over lapping since I have used both optics for the same image.